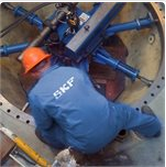 Our product range comprises tools for the mechanical, hydraulic and thermal mounting and dismounting of rolling bearings. Mechanical tools are used predominantly for smaller bearings. Medium-sized and large rolling bearings are mainly mounted and dismounted using hydraulic or thermal tools. The range is logically rounded off by measurement and inspection devices (such as transport tools and gloves). Rolling bearing greases Arcanol offer the best conditions for achieving reliable, durable and cost-effective bearing arrangements. These greases are designed to give favourable running behaviour of the bearings and thus make an important contribution to preventing premature bearing failure. The Arcanol range is graduated such that almost all areas of application can be covered to an optimum extent. It includes both standard and special greases. These products assist in the alignment of shafts and belt pulleys and the checking of belt tension. This reduces wear of bearings and seals, resulting in reduced heat development as well as higher economic efficiency through reduced energy consumption, and increasing machines’ running times and reliability. Condition monitoring contributes to achieving high availability and long life of machinery and plant. FAG products help in planning maintenance work and reducing costs. The range includes devices for the alignment of shafts and belt pulleys. Temperature measuring and sonar devices make it possible to check the operating condition. An important element of the range comprises measuring systems that monitor vibration, torque and lubricants.